Split testing (also known as A/B testing) is a method that gathers data to help your campaigns perform more effectively. There are many ways to do this, including split testing on your website, on platforms like Google Ads, and split testing on Amazon. In this article, let’s discuss how to split test Facebook Ads, both using Facebook Ad Manager and an alternative (and perhaps cheaper!) method using PickFu. Split testing Facebook Ads helps you learn which ad creative, audience, delivery, or placement best meets your marketing goals. The test is created by showing two or more versions of an ad to see which one performs better for your chosen variable. Once your split test is complete, you can use the data to help improve future campaigns. How does Facebook split testing work? Your audience is divided into distinct groups of people. Using the Facebook split testing feature, these groups will not overlap. Each group is shown ad sets that are identical except for the variable you’ve decided to test (see below). Each ad set is measured against your defined campaign objective. These objectives include sales, app installs, video views, traffic, and more. When your A/B test is complete, Facebook notifies you of the winning ad set. What variables can you split test on Facebook? Delivery optimization: Using this variable, you can test whether optimizing for clicks or optimizing for conversions works better for your company. Keep in mind, optimizing for link clicks is based on a cost-per-click (CPC) pricing model while optimizing for conversions is priced on a cost-per-impression (CPM) model. Another example test using this variable is optimizing for conversions with a conversion window of 1 day vs. a conversion window of 7 days. Audience: Using the audience variable, you can show your ads to various audiences using Facebook’s targeting parameters. In the past, if you set up multiple ad sets to try to split test audiences manually, you were bound to have some overlap (meaning one person could be included in both groups). Using Facebook’s split testing feature eliminates that worry and keeps your test audiences distinct. Placements: Using the placement variable, you can test where your ads are displayed to see what placement works best for your campaign. For instance, do ads within the Facebook feed work better than ads on the right column? What about mobile vs. desktop? Do automatic placements work better, or should you manually customize your placements? Product sets: Using this variable, you can test different products in your Facebook catalog. For example, you might want to test product sets with different price points or one brand you offer over another brand. Creative: You can still test which versions of your ad work best. You can vary up the image, video, text, headline, or call-to-action (CTA), or some combination of any of these factors, to see how it affects the campaign. In order to create a split test on Facebook, you can either use Facebook’s Guided creation, use Quick creation, or duplicate an existing ad set. With guided creation, you choose the marketing objective for your campaign, then select Create Split Test and Continue, and Facebook will walk you through the rest of the steps. You will choose your variable, budget, and duration for your test. With quick creation, you create the structure for a split test that can be finalized later. More details may be found here. To duplicate an ad set, select an active ad set, click Duplicate, then toggle on the Create a test to compare a new ad set to your original option. When you split test ad creative on Facebook, you pay for every click or impression (depending on your campaign setup). Alternatively, many advertisers like to use PickFu to optimize their ad creative before pushing it live to a Facebook campaign. Why? Predictable (and potentially lower) costs: When you run a poll on your Facebook ads, your poll cost is determined at checkout. It’s a one-time flat fee. You’re not waiting to see how many clicks or impressions you get (and that you’ll have to pay for) with a live test on Facebook. Faster results: A split test on Facebook has to last between 3 and 14 days. Using PickFu, most polls complete within 15 minutes. Your landing page doesn’t need to be ready: Using PickFu, you can create your ad sets while your landing pages are still being developed. Privacy: Polling on PickFu means your ads aren’t yet live. The product you’re advertising can remain stealthy if need be. All PickFu poll respondents have signed a non-disclosure agreement. Written responses: PickFu respondents not only vote on the Facebook Ad they like better, they include a written comment explaining why they made their choice. With PickFu polling, you can see whether consistent themes emerge about your copy, imagery, or video, so that you not only understand which ad your audience likes better but why. Audience targeting: Much like on Facebook, you can use audience targeting to get opinions from people who are similar to your target audience. You can target audiences by gender, age, mobile device, reading habits, political leanings, and more. Split testing Facebook Ads with PickFu will only test the Creative variable. For all other variables (Delivery optimization, Audience, etc), use the method described in the “How to Test Facebook Ads using Ads Manager” section of this article. Log in to your Facebook Ads Manager and choose 2-8 existing ads, or create 2-8 new ads. In this example, the two ads promote the same video but have different copy. The thumbnail image and article title are the same. In this way, we’re only testing one parameter – the copy. Let PickFu do the rest! After running this poll, Option A won. Respondents preferred the idea of judging a book by its cover. The poll took only 13 minutes to complete, whereas if we had run a live split test on Facebook, it would have taken 3-14 days. The difference between testing on Facebook and testing with PickFu is that on PickFu, users see the various test options and weigh them against each other. On Facebook, they’re not aware a test is happening. They’ll only see one of the ads in your ad set, and they’ll only click on the ad if they were going to do so anyway. PickFu provides a quick and dirty way to ensure that before you go live on Facebook, your ad creative has already been tested with an audience. Respondents provide valuable feedback about what they think about your ads, including how they perceive its tone, helpfulness, and appeal. 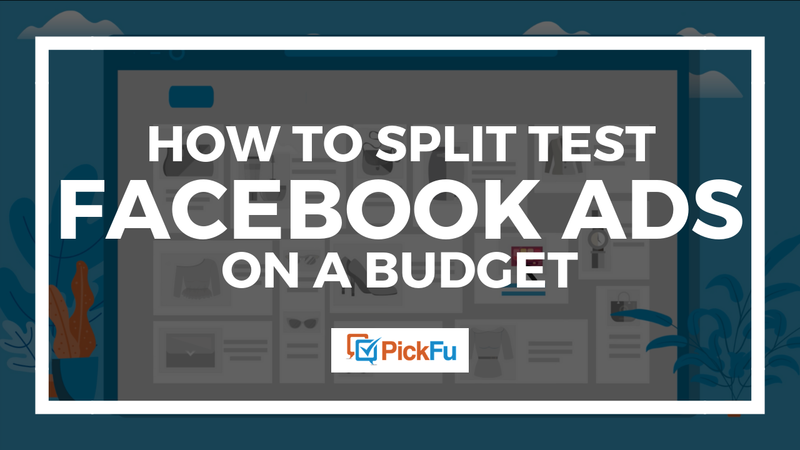 Want to split test your own Facebook ads using PickFu? Set up a poll now – it only takes a minute!